...Set: Glee 1x19 "Dream On"
Though Glee tends to get overly literal with its themes in each episode, at least they are usually fairly sincere. This week was all about dreams and how they can possibly be shattered. But the best news about this week was that it featured Neil Patrick Harris in an awesome guest star role as Bryan Ryan, former Will Schuester out-doer and current school board member looking to cut the glee club. It was also directed by Joss Whedon, what what! See, Bryan used to be the star of the glee club back in the day, and thought that meant he was going to be a big star after high school. It didn't quite happen that way, and now he wants to take these kids down a peg. Will won't have that, and after a beer gets Bryan to admit that he really misses singing and feels empty without it. Will encourages him to try out for an upcoming local musical production of Les Miserables, that leads to a sing-off between the two of them. Bryan, certain that he has won the role over Will, decides he's going to cut back some of the Cheerios budget and give it to glee. But when he finds out that Will actually won, he takes it all away. Will gives him a whole big speech about stars and black holes, but it's not until he tells Bryan that he'll give him the role if he keeps the glee club that Bryan decides to keep glee around. All around a very fun performance by NPH, right? 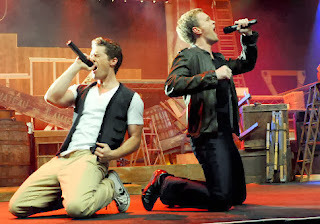 He was great, as he tends to be, and he got to perform a couple of songs with Matthew Morrison - Piano Man and Dream On. The other big storyline of the night centered around Artie. With all of this dream talk, Artie is forced to admit to Tina that his dream is to one day be a dancer, but he knows it can never be. He tries to use some of those arm thingys that people with cerebral palsy use (I truly apologize, but I have no idea what they are called) while creating a dance number with Tina, but ends up falling and getting really upset about her seeing him that way. She tells him not to give up hope and presents him with a ton of research about emerging techniques on fixing broken spinal cords. He then has a really fun dream sequence of a big dance number set to Safety Dance and gets psyched about the possibility. He goes to see Emma to and tells her he thinks the new research is going to get him to walk again, but she is forced to give him a dose of reality and tell him that any of these techniques won't be available for human testing for at least 10 years. Awwww, Artie! He tells her she should have someone else dance with her in their number, but she asks him to at least sing for them. She dances with Mike Chang (other Asian!) while Artie sings Dream a Little Dream of Me. In the third main storyline of the night, Jesse is back in town after his spring break, and gets Rachel to admit her secret dream - to meet her mom. They do some research, and it's here that we learn that Jesse DOES have a secret agenda after all! He slips in a tape "From Mother to Daughter" into one of Rachel's baby memorabilia boxes. At this point, if you hadn't figured out that Shelby, the Vocal Adrenaline coach, was Rachel's mom, then you're sorely behind the times when it comes to TV viewing. I hadn't thought about it until then, but once that happened and I stopped to think how much Idina Menzel and Lea Michele do resemble each other, it was like BAM! It was confirmed later on when Jesse and Shelby had a meeting where we learn that Jesse's main mission was to get Rachel to figure out who her mom is, then go back to Vocal Adrenaline. Jesse, however, has started to fall for Rachel, and doesn't want her to get hurt. I'm guessing they're going to try to get her to join Vocal Adrenaline. Anyway, Rachel at first refuses to listen to the tape, but Shelby makes Jesse force it on her, which then turns into a duet number between Rachel and Shelby of I Dreamed a Dream. Next week: Glee goes Gaga! I'm sure everyone has been waiting for this day, and it looks to be appropriately crazy.